During the third day of the Foreign Investors Summit (FIS), panelists tackled topics such as Romania’s potential to attract investments, and pinpointed the sectors most likely to secure funding from both financial institutions and private investors. They also highlighted the need for entrepreneurial education to boost growth. The financiers participating in the Funding round | Perceptions vs Realities discussions rated Romania’s attractiveness as a destination for investors in the current economic and political climate very highly. Due to its current political stability and strong economic growth rate, Romania finds itself in a favorable position, compared to neighboring CEE countries. “Romania is on the map of investors. This is a very interesting wind of opportunity for the country. Turkey is no longer the promised land. Here there is fertile ground,” said panelist Matteo Patrone, EBRD Romania director. Patrone said the EBRD offers two products for SMEs, under two pillars, namely the financing stream and the advising stream. However, banks can also benefit from financing opportunities. “The advisory stream is deployed in synergy with the first pillar. We advise SMEs in all sectors and areas from government to private sector companies. For smaller companies we employ local consultancy firms and for larger ones we use international consultancy companies,” Patrone outlined. 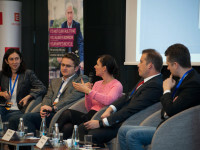 According to venture capitalist and entrepreneur Marius Ghenea, a speaker on the same panel, the perception of Romania has improved in recent years. “We’re seeing big players in private equity coming to the country. Romania has the highest GDP growth in the region; the financial markets are stable. Also, political stability is important. Neighboring countries such as Bulgaria, Poland, Ukraine Turkey have political issues, which makes Romania a safer destination for investments,” he commented. As far as investments are concerned, Ghenea said that 3TS Capital, the private equity and venture capital fund he manages, invests “in local companies that can become global challengers. We do not expect to breed global leaders, but we do expect local challengers. We believe the travel industry is an untapped industry. Agriculture and related industries, such as food processing, are also interesting. So too is the energy sector, which is usually limited to traditional and big investment. However, there is potential for smaller investors. And of course, we should go for renewables, and not fossil fuel,” he argued.However, entrepreneur and business angel Sergiu Negut warned that the business environment should be aware that Romania‘s efforts to attract big investments could be hindered if its neighbors are not performing well. “Although most of our neighbors are doing well, being an island of something that looks attractive is not necessarily helping us. For the larger region, it is not going well, because investors want a big market, meaning the whole region,” Negut said. The need for entrepreneurial education emerged as a major theme across panels, with speakers representing both the public and private sector stressing its importance. A speaker on the Industry Zoom: Impactful Entrepreneurial Ventures panel, Ilinca Paun, managing partner at Colliers International, stressed that education is a powerful and necessary tool in shaping the future of entrepreneurship in Romania and highlighted the need to bring companies closer to start-ups. “In Romania we have a lot of entrepreneurial spirit. Young people hate corporations. That is why they should integrate more start-ups in their structure. Young people today are much braver than wewere,” she said. For co-panelist Bogdan Iordache, managing director at MVP Academy, things are already moving in the right direction. “We are very lucky to be part of this transformation, to carry it forward,” he said, while making a case for self-development. “Do not read books about it, but do something; be an entrepreneur,” he told the audience.